The word Quiz: a Dublin invention? | Come Here To Me! The word Quiz: a Dublin invention? 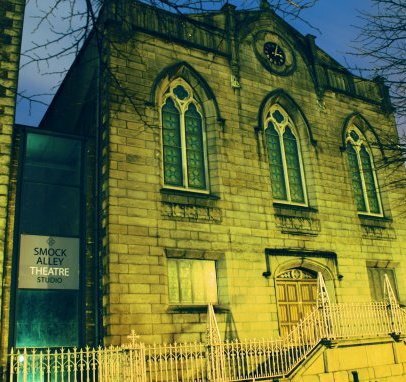 There is an enduring urban legend that suggests that Irish actor, and manager of the Smock Alley Theatre and afterwards the Theatre Royal in Dublin, Richard Daly (1758 – 1813) invented the word ‘Quiz’ to settle a bet in 1791. The story goes that there was a gathering of the Dublin Volunteers to celebrate the birth of an heir to the Duke of Leinster in the Eagle Tavern in Eustache Street on August 21 1791. Present were ‘many of the wits and men of fashions of the day’ (1) as well as Daly who ‘had an extraordinary propensity for making wagers in reference to incidental maters, however unimportant’ (2). As the legend goes, Daly sent all of his Theatre stage-hands and call-boys to chalk the letters ‘Q U I Z’ on the doors of shops, warehouses and people’s houses all over the city. People woke up on Sunday morning to be greeted with the word every where they looked. It soon became the talk of the town with neighbour asking neighbour what the word meant. After initial speculation that the word had something to do with politics or perhaps religion, the public of Dublin accepted that it had been successfully duped and the word became synonymous with the idea of a ‘hoax’ or something ‘strange’. 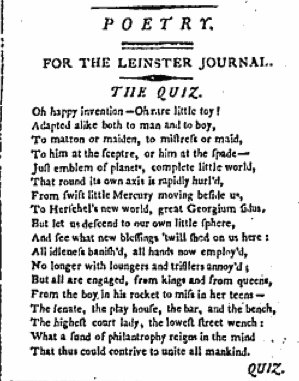 While it’s a splendid anecdote, the word ‘Quiz’ was certainly used pre 1791. It can found, for example, in Fanny Burney’s diary entry for 24 June 1782. Finns Leinster Journal. May 21, 1791. While the word may not have been invented by Daly, it is true to say that it was not a commonly known word at the time, so it is possible (and quite nice to think) that Daly may have played some part in spreading the use of the word world-wide from little old Dublin. The American website Museum of Hoaxes incidentally featured the story recently enough. A quizzical story teh be sure!